Get your business up and running more quickly. 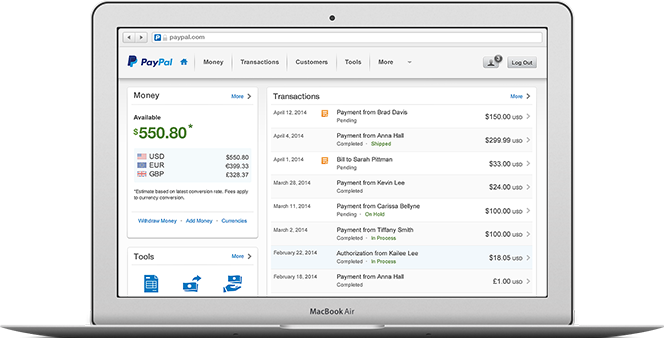 Optimize your business opportunities with your PayPal account. Set up your business profile and choose your type of payment solution. Enjoy piece of mind. Our Seller Protection safeguards your eligible sales with fraud protection, 24-hour monitoring and advanced encryption. It’s easy to withdraw funds from your PayPal account through E.SUN Global Pass. Update your business name so it can appear correctly on your customers’ card statements and help them remember where they shopped. Tell your customers how to get in touch with you or notify them about shipping delays. They will be less likely to file a dispute or claim. Provide accurate and more detailed business information, such as your company URL. It can help us verify your identity and manage your account better. Add multiple users or tailor your selling tools. Track and measure your business performance in a click. Add PayPal logos and banners to your site so your customers know you have chosen PayPal to process their payments more safely. Why should I sign up for PayPal? PayPal branding and presence – whether on your website or sell on eBay – benefits both you and your customers. You’ll increase their confidence in your products and services and help them enjoy a faster, safer and more informed checkout experience. How can I start accepting payments with PayPal? 3 simple steps to get you started. 1. Sign up for a PayPal account for free. 2. Confirm your email address with us. 3. Choose your preferred payment solution. How do I accept payments without a website? You can send a payment request to your customers through email. All you need is their email address. Then it’s just one click for them to pay by credit cards, debit cards, bank accounts or PayPal balance (whichever is applicable). More on Email invoice. How do I accept payments on my website? It is easy to set up PayPal buttons as a great way to accept payments including credit cards, debit cards or bank payments on your website. Just paste some code into your site and you’re ready to go. There is no set-up cost, simply pay when you get paid. If you already have a shopping cart: For PayPal-compatible carts, select PayPal as your online payment service. If you have a custom-built cart, add PayPal by cutting and pasting some HTML code into your checkout. If you need a shopping cart: Choose a shopping cart that's already integrated with PayPal. Or add PayPal Express Checkout to your website. If you don't need a cart, add our payment buttons: Simply copy and paste some HTML code into your website to link your customers to a more secure payment checkout hosted by PayPal. Create a PayPal payment button. More on accepting payments online.